them to the Black Gate of Mordor. In Rohan, the pack of Uruk-hai run across the grassy landscape with their captives Merry and Pippin. including the king's only son Théodred. Théoden's nephew Éomer interrogates Gríma, angrily realizing he has lustful eyes for Éomer's sister Éowyn and that he is now an agent of Saruman. Gríma banishes Éomer for undermining his authority and Éomer sets forth to gather the remaining loyal men of the Rohirrim throughout the land. Frodo and Sam traverse the Dead Marshes, passing the undead fallen warriors of the Second Age who haunt the marshes and evading a newly seated Ringwraith on his flying fell beast. Later they reach the Black Gate, finding it to be heavily guarded, (they observe a contingent of Easterlings from Rhûn arrive to reinforce the garrison) only to have Gollum reveal to them a less risky path: Sam remains distrustful, but Frodo gives him the benefit of the doubt. Meanwhile, Éomer and his Rohirrim ambush and kill all of the Orcs and Uruk-hai holding the two Hobbits captive at nightfall. During the battle, Merry and Pippin narrowly escape their captors by fleeing into the trees where they are aided by Treebeard the oldest of the Ents. exorcise Saruman's hold on King Théoden and banish Wormtongue. Théoden is confronted with his dead son and rather than risk open war, decides to flee to a large fortress called Helm's Deep which in times of trouble has saved the people of Rohan. Gandalf leaves to find Éomer and his Rohirrim, promising to return within five days, as a strong attraction draws Éowyn to Aragorn during the journey to Helm's Deep. 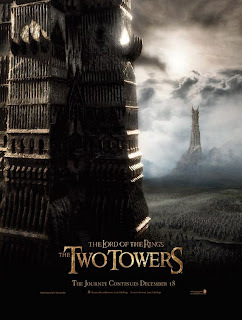 Wormtongue flees to Orthanc and tells Saruman of Rohan breaking from their grip; Saruman then decides to destroy Rohan. Faramir, the younger brother of Boromir. Gollum eluded capture and in order to save his life, is lured into a trap unknowingly by Frodo. Faramir learns of the One Ring and, seeking to prove his worth to his father, decides the Ring shall go to Gondor. In Rohan, Aragorn washes up on the river's edge and is nudged back to consciousness by his horse, Brego. Battered but undaunted, he rides to Helm's Deep, passing Saruman's army of Uruk-hai, which numbers at least 10,000 strong. His arrival is met with relief but is short lived with the news of only 300 men in the stronghold. In the midst of despair, a battalion of Elves from Lórien, led by the Elf Haldir, arrives to assist in the ensuing battle. At Fangorn forest, Merry, Pippin, Treebeard and other Ents hold a Council to decide on the roles of the Ents in the war with Saruman. In the pouring rain, the battle of Helm's Deep begins with a flurry of arrows from both human and Elven archers cutting down dozens of Uruk-hai. Scaling ladders are placed upon the Deeping Wall, and the Uruks swarm up to engage the defenders. The defenses are slowly being breached and the enemy manages to destroy the wall through its sewer drain, using a rudimentary explosive device created by Saruman. Despite Aragorn and Gimli's best efforts, the Uruk-hai manage to penetrate the main door and soon the stronghold is overrun. In the midst of battle, Haldir is slain and the few remaining Elves fall back into the Keep. In the Hornburg, however, the Uruks have also scaled the walls, and have breached the gate, forcing the defenders to retreat into the Keep. In Fangorn, Treebeard and the other Ents have decided to not have any involvement in the war. Frustrated, Pippin cleverly takes him to the section of Fangorn Forest Saruman has decimated near Isengard. Treebeard is filled with rage at Saruman's betrayal and commands all other Ents to seek vengeance. The Ents gather and embark upon 'the Last March of the Ents'. Meanwhile, as the Keep is now under attack and realizing Gandalf's words before he departed, Aragorn and the rest make one last gallant ride on horseback to attack the Uruk-hai army, in a desperate bid to allow the Rohirrim's women and children to escape. As the riders are surrounded and all seems lost, Gandalf, Éomer, and two thousand Riders of the Rohirrim arrive to push back the Uruk-hai into the just-arrived forest of Huorns outside of Helm's Deep. Elsewhere, the Ents also attack Isengard, tossing stones and rocks while collapsing a dam to flood its surroundings. At the ruins of Osgiliath, Faramir and the Hobbits are confronted by a Ringwraith and its fell beast. subsequent mistreatment by Faramir's men, Gollum's darker nature returns and decides to reclaim the ring by leading Frodo and Sam to "her".